For some reason there's been a lot of buzz recently about title sequences. Of course there's always the estimable site The Art of the Title Sequence, which regularly posts and analyzes opening credits from films. But in the last few weeks, sites like The Fox is Black and The Atlantic highlighted Jurjen Versteeg's cool new short A History of the Title Sequence. Back in February IFC.com did a whole thing about The 50 Greatest Title Sequences of All Time. And for some reason a bunch of my Facebook friends sent around a bunch of credits clips last week. 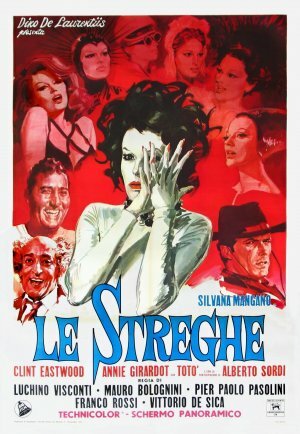 Long story short: This is a great excuse to post what I think is my favorite opening credits sequence of all time, for the amazingly bizarre Italian omnibus film Le Streghe (The Witches). Video after the jump.